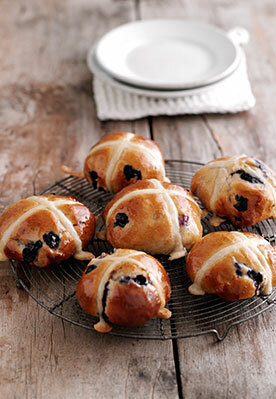 Hot cross buns with a fresh, fruity twist! Serve any leftovers toasted the next day. 1. Mix the flour, salt, spice, sugar and fruit rinds together in a large bowl. Add the butter and rub in with fingertips until it resembles fine crumbs then stir in the yeast. 2. Warm the milk in a small saucepan or in the microwave until it feels warm to your little finger. Add the egg to the flour mix then gradually mix in enough of the warm milk to make a soft but not sticky dough. 3. Tip out on to the work surface then knead for 10 minutes, dusting the work surface lightly with flour as needed. Put the dough back into the bowl, cover with a teacloth and put in a warm place for 45-60 minutes until the dough has doubled in size. 4. Knead the dough once more then gently knead in the blueberries. Cut the dough into 12 pieces, shape into round buns and put slightly spaced apart on a large greased baking sheet. Cover loosely with a large piece of oiled clingfilm and leave to rise in a warm place for 20-30 minutes. 5. Sift the flour for the crosses into a bowl and mix in just enough water to make a smooth pipeable mixture. Spoon into a disposable plastic or greaseproof paper piping bag, snip off the tip and pipe crosses over the buns. 6. Bake at 190°C/375°F/gas Mark 5 for 15 minutes until well risen and golden. Meanwhile make the glaze by dissolving the sugar in the milk in a small saucepan then boiling for one minute. Brush over the buns as soon as they come out of the oven. Leave to cool then serve split and buttered.